Based on our research it would appear that Ohio is a proactive in terms of gambling. They don't have any online poker laws. However, they have relaxed their laws to allow home poker games. And they've built new casinos in the last few years with plans to develop more in the near future. When you combine that with the recent stories that cover the necessary steps to regulated internet gaming, it's not so much a matter of how, now, but when they'll do it. Ohio is certainly much further along than, say, Texas or Utah. There are no laws that specifically mention online gambling. That doesn't mean you should assume that it's legal, though. It could easily fall under one of these statutes. (D) "Game of chance" means poker, craps, roulette, or other game in which a player gives anything of value in the hope of gain, the outcome of which is determined by largely of chance, but does not include bingo. A desk or laptop computer, mobile phone or tablet could be considered a "gambling device." (5) With purpose to violate division (A)(1), (2), (3), or (4) of this section, acquire, possess, control, or operate any gambling device. This statute states that if you're playing for a living, or using a gambling device, that you're illegally gambling under Ohio state law. So one could easily assume that online poker is illegal within the state. However, based on our research no one has been arrested for it. In addition to that, another Ohio statute (mentioned in the next section) says that gambling carried on for pleasure rather than profit is ok. All poker sites accept real money players from Ohio, too. Home poker games are legal so long as no one is making a profit other than from the game itself, and that no player is playing to profit to earn a living. The fundamental thrust of new Chapter 2915. is to prohibit the business of gambling without forbidding gambling carried on for pleasure rather than profit. Under the chapter, all forms of gambling and activities in aid of it are illegal if carried on as a business, or for personal profit, or as a significant source of income or livelihood. Otherwise, no form of gambling is illegal. Gambling in public is prohibited to avoid enforcement problems, and this represents a partial exception to the general rule in the chapter. This statute gives a relaxed feeling about gambling, even in public. It sounds as if public gaming would be ok if they were able to police it better. Do Casinos in Ohio Offer Poker? Hollywood Casino (Columbus/Toledo) - Holdem, omaha and bad beat jackpots. We receive a lot of questions about the legality of poker in Ohio. We decided to answer our most common questions and post them here for everyone to benefit from. Will online poker be regulated in Ohio? From our research we didn't find any attempts to regulate online gambling. Ohio hasn't given us any reasons not to think that they might regulate real money poker sites in the future, though. Here are the most recent gambling updates to come from Ohio. When more news breaks we'll post it here. June 10, 2013 - Ohio's current amendment(s) make it difficult to bring internet gambling to the state. There are ways to tweak the current laws according to I. Nelson Rose. According to gaming attorney, Prince, officials will likely determine if Ohio's current casinos (and future casinos being built) in addition to online gaming would overload residents. May 29th, 2013 - The Ohio Governor, John Kasich, signed legislation that would eliminate internet sweepstakes cafes. The bill will take 90 days to be "in effect." However, people against the bill are working to repeal it, which could prolong the time it takes for the bill to take effect to as much as a year, or more, if it ever does. Is there an online poker room that accepts players from Ohio? Yes. Ohio residents shouldn't have a problem finding a poker site. The best options right now include Bovada, Carbon Poker and BetOnline. What other forms of regulated gambling is offered in Ohio? Residents can gamble at any of the commercials casinos in the state, as well as in the state lottery and para-mutual races. Non-profit games exist, too. You can participate in raffles, bingo, fishing derbies and casino games, with the exception of craps and roulette. Where can I read more about Ohio poker laws? 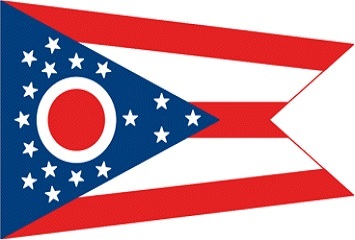 Here are some interesting Ohio-themed poker and gambling facts. Para-mutual betting was first made legal in 1933. Commercial casinos weren't legal until 2010. Ironically, Ohio has been the state of the premier manufacturer of casino seats since 1960. Chip Reese was born in Dayton Ohio. He's known for being the worlds best 7-card stud player. He wrote a chapter on the game in Doyle Brunson's Super System. At one point cheating was not considered an offense. However, under the current laws, it is. Cheating as such was not an offense under former law, but is an offense under Chapter 2915. regardless of whether the gambling activity in which it occurs is legal or illegal. For penalty purposes, cheaters are treated much the same as thieves under new section 2913.02 of the Revised Code. A simplified version of a former prohibition against "fixing" sporting events is also included in the chapter.